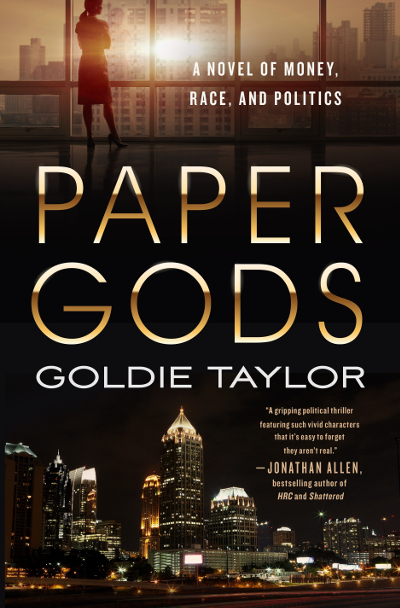 A St. Louis native, after a 10-year hiatus, her third novel–Paper Gods– will be released in October 2018 by St. Martin’s Press. Goldie Taylor is an novelist, opinion writer and former political strategist. Now editor-at-large for The Daily Beast, Goldie has been a featured political analyst on nearly every major news network. She has been a guest on programs such as HBO’s Real Time with Bill Maher, The Dr. Phil Show, The Steve Harvey Show, and Good Morning America. Goldie appeared in “Light Skinned Girls,” a documentary released by the Oprah Winfrey Network (OWN) and “Eyes on the Prize: Then and Now” on PBS. An avid runner, Goldie is the mother of three grown children and two grandchildren. She is, thus, convinced that God has a sense of humor. Check out her website here, Facebook and Twitter. Paper Gods is in stores now. You can listen below to the interview.